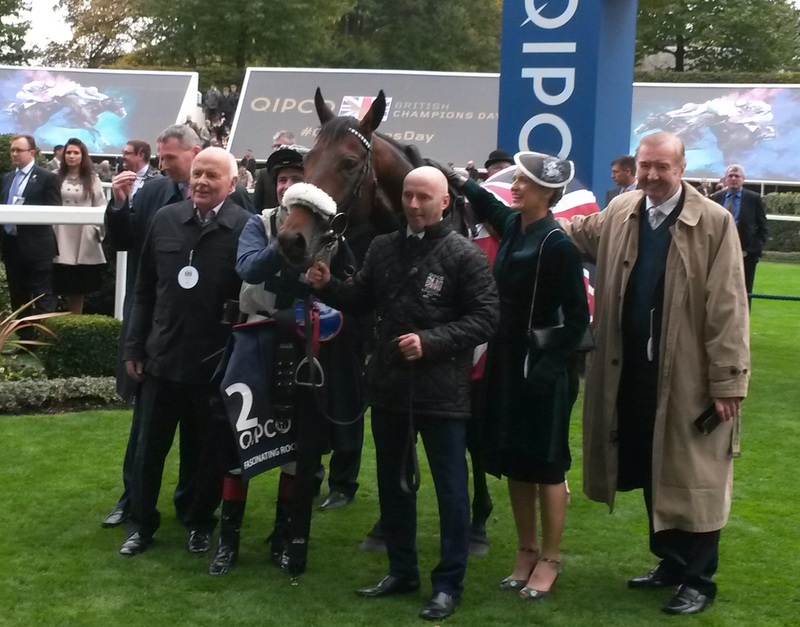 Dermot Weld (right) and winning connections after the victory of Forgotten Voice in the Qipco Champion Stakes. A total of 30,697 people attended the fifth Qipco British Champions Day where 10-1 shot Fascinating Rock was the surprise winner of the featured £1.3million Champion Stakes. The valuable six-race card at Ascot on Saturday offered total prize-money of £4.1million and was contested in a celebratory atmosphere where the last race went off 15 minutes before the first Rugby World Cup quarter-final, which was shown on big screens after racing. Fascinating Rock’s victory in the penultimate race rewarded a long-term term plan by connections as the Irish-trained four-year-old improved from his midfield position to challenge a furlong out and score by a length and a quarter for Pat Smullen. “Fascinating Rock has always had the potential to do what he did today, and I had this race planned for about six months,” winning trainer Dermot Weld revealed. “We knew it would be softer in the autumn, and he loves soft ground, and he was a decent horse in the spring. “He was only just beaten by Al Kazeem in May’s Tattersalls Gold Cup, with King George winner Postponed in third, then we left him off for the summer, giving him time by the banks of the River Suir – and then he came back in. “I probably left him too short of work for Windsor [when third in Group 3] and he was on the horse lorry for about four hours longer than ideal [because of traffic problems]. That may explain why he ran flat at Windsor in his first run for four months. “Then he won by six lengths on Irish Champions’ Day at Leopardstown and I was impressed with the way he did it, and then we stuck with the original plan which was this race today. The plan was to ride him off the pace and I told Pat to give him time and hunt away on him and he came home in front. That will be his final run this season. Fascinating Rock’s victory was preceded by the success of Solow in the £1.1million Queen Elizabeth II Stakes. Solow’s win follows victories in the Queen Anne Stakes and Qatar Sussex Stakes. Trainer Freddy Head intends to follow the same programme with him next year and officials remain intent on building on the success of Champions Day. “Qipco British Champions Day is a long-term commitment and we are delighted with its progress,” British Champions Series chief executive Rod Street said. “We think this year has been the best yet in terms of quality, strength and depth and it is fantastic to see some of the best horses in Europe winning these championship races on Britain’s richest raceday, including Murhaarar, Solow and Simple Verse.